Little did the brothers Starn realize the auspicious timing of the installation of their massive outdoor sculpture when they agreed to bring their team and materials to the Israel Museum Art Garden. Knotting Joints of Big Bambu by Mike and Doug Starn. 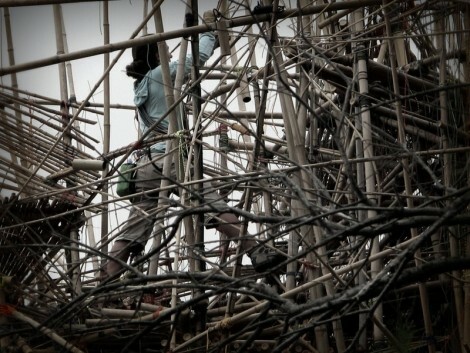 For their work Big Bambú, an exploration of the place of the individual in a chaotic world, the timing simply could not have been more apt. Art is never created in a vacuum, where it is seen and by whom it is seen is significant. 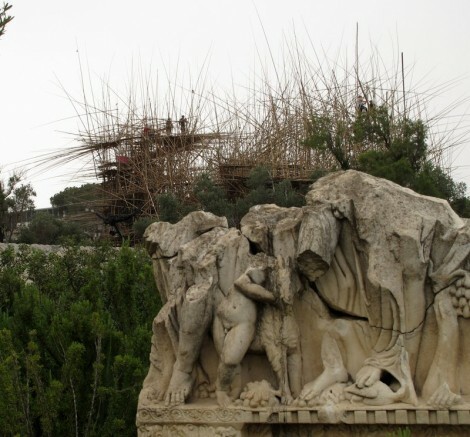 Shortly following the opening of this bamboo construction here in Jerusalem, Israel was thrust into a national drama concerning the disappearance of three high school boys. 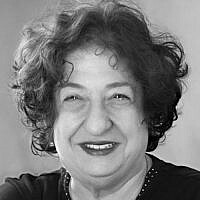 The names Eyal Yifrach, Gil-ad Shaar and Naftali Fraenkel quickly became seared into the public consciousness and for those days of uncertainty they brought together people from around the globe in unity with the parents; we collectively waited to hear the slam of a door like always, yet only quiet answered. Students returning home from school and being Jewish became a deadly combination at the hands of their captors. From mass prayers at the Western Wall to lighting extra Shabbat candles, people around the world connected to the panic-inducing event that any parent, child, indeed anyone with a beating heart and a connection to humanity could relate. News junkies hung on every report until the quiet broke on day 18, a number normally symbolizing life in Judaism. That was not their fate. A sense of connection stretched like an invisible cord around Israel and around the globe bringing together the hopes and prayers of a range of people, crossing lives of diverse paths, and binding them into a silent bond of strength. The twin brothers, Mike and Doug Starn, could not have anticipated these events, yet similar concerns seem to be echoed in the current form of Big Bambú, called Five Thousand Arms to Hold You. Born in Absecon, New Jersey in 1961, they have been collaborating since their early teens. They defy pigeon-holing with the range of their interests spanning photography, nature, culture, religion, and human connection. Early works investigated nature in photography, which garnered their first public recognition at the 1987 Whitney Biennial. In commemoration of 3,000 years of the city of Jerusalem, their work Ramparts Café at the Jewish Museum of New York, combined observations centered on Jerusalem coffee shop culture as a contemporary expression of the city. This was set against old documents from Judaism, Christianity and Islam to reflect upon religious conflicts. In Big Bambú, they focus their attention on questions of chaos and order in nature, interconnection and interdependence between people. 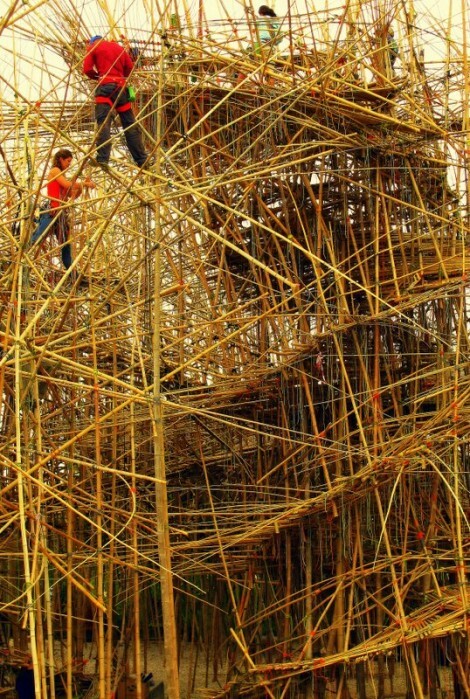 Comprised of thousands of bamboo canes, each individual component can be seen as just another piece of a seemingly fragile construction. Or as part of something greater than itself. Following 7 weeks of work by the artists and their crew of mountain climbers, they created a cohesive structure which seems to parry and lunge as if an invisible fencing match took place in the open Isamu Noguchi-designed Art Garden. This unusual configuration stands in sharp contrast amongst the more recognizable sculptural forms that are its neighbor; a white concrete Picasso sculpture appears static alongside seemingly untamed chaos. The installation was created as a dynamic unfolding organism, which looks like a giant game of pick-up sticks gone wild. It is meant to be explored from without in the traditional way, but also climbed on and experienced from within, enabling visitors to become participants and temporarily join with the work itself. The design tames the mass of canes into a purpose-filled structure with paths and nooks to explore. This is more than a reach back to your inner child in the guise of a natural jungle gym. Living in a scary world, with terrorism all too easily invading our individual constructs of comfort zones, making order from chaos is something that speaks to many. With a breath-takingly rapid descent into an evolving security confrontation as Hamas sends missiles to rain again on our southern (and not so southern) communities and with the IDF poised along Gaza as of this writing, our current crisis presents an even more vivid and dramatic backdrop against which this installation will be experienced. The Starns surely want you to enjoy the climb and the pleasurable discoveries. They also want you to direct your attention to the small details. 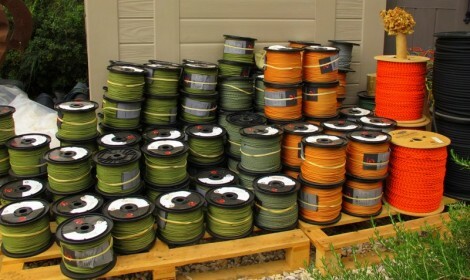 The canes are all hand-tied together with colorful knots of cords. These many joints help us pause briefly to consider the ties that bind us, as individuals one to the other. In the name of full disclosure, I hold a part-time day job in the Israel Museum (and the thoughts expressed in this blog are mine and not that of the hand that feeds me). Walking passed the ongoing construction while coming and going, I found myself being won over by this work. I took the accompanying photos during the last stages of knotting. This is a piece that makes the most contemporary works around it suddenly look a bit more middle-aged, more staid, next to what feels to me as a 3D swirling mass of lines frantically slashing in space. Anyone who has spent time in Israel during a national crisis, cannot fail to note the heightened sense of coming together, caring, an extra layer of connection which is palpable. The recent roller coaster of emotions of the passed several weeks – the three funerals for young Jewish boys, the funeral of Muhammed Abu Khdeir, Rachel Fraenkel’s quiet eloquence, riots, continuous missiles, army responses, soldiers leaving civilian lives to report for duty, and the anticipation of the unknown still ahead – are the swirl of events that pull our emotions along with each news item. The sense of unity that many felt for those 18 days and the acts of kindnesses large and small are part of what makes a People. Though the unity quickly seemed to evaporate into business as usual, the afterglow is still in our minds, and the current tensions are yet another reminder that we are all ultimately bound one to the other. Simple acts of kindness between peoples also happen in times of calm, but it is during crises that we seem to have a heightened sense of awareness to see and do good. It is sad that such events bring us together. Sadder still that there is an ever-widening gulf between ourselves and our neighbors across the wadi. 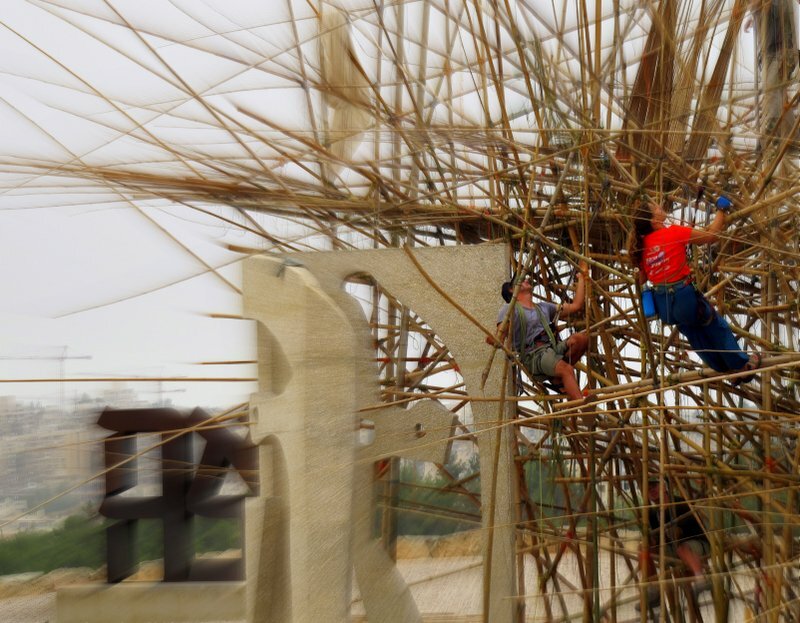 These interconnections and feelings of interdependence underscore the experience of Big Bambú. Each step has a corresponding reverberation. We can understand this as a work meant to buoy us up, giving us the reassurance that there are thousands of arms to hold us.